Mention Orlando, Tampa, Miami or even Jacksonville, St. Augustine and Sarasota. People instantly get the reference: Florida, the Sunshine State. But Gainesville? Where�s that again? It�s a city of about 125,000 in north central Florida, a little more than 100 miles north of Orlando and about 150 miles southeast of Tallahassee. It's home to the state's oldest and largest university, the University of Florida (not to mention its famous football Gators whose home games consistently sell out the 90,000-seat stadium), and to several famous former residents including Bo Didley, Tom Petty, River Phoenix and Bob Vila. Fine. But what�s it got to offer visitors? Well, plenty. There are historic sites and quaint villages a stone�s throw away, excellent eateries, intriguing bed and breakfasts, and � not the least � the Florida Museum of Natural History, with its famous butterfly rainforest and world�s largest research facility devoted to Lepidoptera. A visit here can easily eat up a day � and more. Gainesville is at the heart � and the seat � of Alachua County, with its collection of historic sites and picturesque towns that market themselves as perfect for film projects. In fact, Doc Hollywood was filmed in Micanopy, just 10 miles south of Gainesville, a charming town exuding a 1930s-'40s atmosphere. Its entire downtown is listed on the National Register of Historic Places. Micanopy is actually the oldest inland town in Florida, originally inhabited by the Timucuan Indians and later a Seminole village and then a 19th century trading post and fortress against hostile natives. The town�s majestic centrepiece is the Herlong Mansion, one of the first homes built by local settlers as a wood-frame cracker cottage, then renovated over the years to a stately classic-revival-style mansion complete with Corinthian columns, and now surrounded by lush gardens bordered by old oak and pecan trees. It was inhabited by founding family members until the late 1960s, then fell into disrepair until it was purchased and converted to a bed and breakfast in the mid-eighties. After several interim owners, it remains popular for overnight accommodation and for weddings and special events, thanks to a wealth of original features � such as the leaded glass windows, mahogany inlaid oak floors, walnut and �tiger oak� panelling and floor-to-ceiling windows in the dining room. Another 11 miles to the southeast the Marjorie Kinnan Rawlings Historic State Park, at Cross Creek, home to the Pulitzer Prize winning author of The Yearling (1938) is open for touring. Rawlings moved to the farming town of Cross Creek in 1928 and fell in love with the countryside. All her major novels were written there � on a typewriter that still sits on a table in the front verandah � and she incorporated the landscape and her neighbours into many of her works. Equally at home with noted writers of the day, including F. Scott Fitzgerald and Ernest Hemmingway, political figures such as Indira Ghandi, and her Florida Cracker neighbours, Rawlings was a consummate hostess, well known for her culinary skills � though cooking on a wood stove � and her dinner parties. Two of her later works, the semi-autobiographical Cross Creek and its companion Cross Creek Cookery, containing many of her recipes peppered with anecdotes, brought the world's notice to the north Florida town. Today her property, originally bequeathed to the University of Florida as a writer's retreat, is managed by the Florida Parks Service and is being restored to give visitors a living picture of its past. In the past year, it has been designated as a National Historic Landmark, the highest recognition by the U.S. for historic properties determined to be of exceptional value in representing or illustrating an important theme, event or person in the history of the nation. Fewer than 2,500 historic places carry that designation. Another step into a past can be experienced at Dudley Farm Historic State Park, a working replica of a farm owned by three generations of the Dudley family who worked the 640 acres for some 150 years. The property was donated to the state by Dudley�s granddaughter Myrtle in 1983. Eighteen original buildings remain, including a general store, canning house, smokehouse, and 1880s kitchen. Park staff, in authentic clothing, go about performing daily chores and activities, as they would have in the 19th century. After exploring sites around the county, not to be overlooked is the Florida Museum of Natural History. Greeted by giant skeletons of a mammoth and mastodon, visitors can explore Florida's history and prehistory. Permanent exhibits include an internationally acclaimed collection of some 500 fossils � many discovered within 100 miles of Gainesville � illustrating 65 million years of history; and Waterways and Wildlife, where visitors can explore the unique biodiverse environments of northern Florida, including a life-size limestone cave. An award-winning people and environments exhibit celebrates those who inhabited the region for thousands of years, including the Calusa, Miccosukee and Seminole Indians. Visitors can marvel at the lifesize dioramas depicting an earlier age, including one of a Calusa leader's house. Also housed at the museum is the McGuire Center for Lepidoptera and Biodiversity, opened in the summer of 2004. Its centrepiece is the 6,400-square-foot butterfly rainforest (pictured above) in a screened enclosure with lush tropical and subtropical foliage, waterfalls and a 400-foot trail where visitors mingle with hundreds of the winged creatures, flying freely. There's also the "Wall of Wings," more than 200 feet long and nearly three stories high, containing thousands of scanned images and actual specimens along with information panels and video screens. 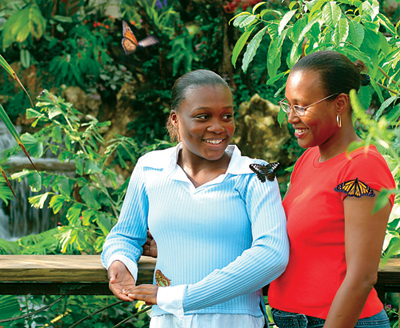 As well, visitors can view butterflies and moths in various stages of their life cycle. While Gainesville offers the usual selection of full service hotels, tourists who want to continue to immerse themselves in the culture and history of the area might well choose one of several unique bed and breakfast inns, each with its own story and history. The Laurel Oak Inn, for example, began its life circa 1885 as a Queen Anne Victorian style home in what was then a city suburb. It changed hands in the 1920s and was converted to two apartments and in the late thirties was again divided into four apartments. In the sixties, when the area was known as "Hippie Hill," it's rumoured that Tom Petty � when his formative band, Mudcrutch, was the local rage � occupied the apartment in what is now the expansive kitchen. Two sets of owners since the early nineties � the latest, current hosts Monta and Peggy Burt � have succeeded in restoring the home to its original grandeur. It offers five bedchambers, each with its own personality. Some include thermo-massage tubs and all have gas stoves or fireplaces and complimentary broadband internet access. The Lilac room features its own second story covered porch, complete with gas lamps, wicker rocking chairs and lap duvets. Next door, the Magnolia Plantation Bed and Breakfast Inn, operated by Joe and Cindy Montalto, is also a restored Victorian home, built in the same period as the Laurel Oak. It suffered the same ravages of hippie and student tenants in the sixties and seventies but was completely restored by the Montaltos who purchased it in 1990. They have also added several cottages in a variety of styles, connected by brick walkways accented by ponds and fountains. More information on local attractions and accommodations is available from the Alachua County Visitors and Convention Bureau at 352-374-5260, on the internet at visitgainesville.net.